Duke coach David Cutcliffe announced on Monday that Jim Knowles will join the team's football staff as a defensive coordinator, while coach Marion Hobby was promoted to assistant head coach/defensive coordinator. This announcement comes after the recent decision by defensive coordinator Mike MacIntyre to take the head coaching job at San Jose State University. MacIntyre shared defensive coordinator responsibilities with Hobby, who was in charge of the defensive line. Knowles, who served as the head coach at Cornell since 2004, will work with the safeties. He re-joins Cutcliffe's staff after a stint with the coach at Mississippi in 2003. He worked with five members of the current Duke staff during that time. "I worked with much of the Duke staff at Ole Miss and we were very successful," Knowles said. "I'm looking forward to being with those guys again. I remember how enjoyable it was to go to work. You have a good time and you're able to challenge each other professionally with schemes on offense, defense and special teams. It is all about trust and selflessness when you have a great staff and that's what those guys have." Knowles was 26-34 at Cornell as a head coach. Added Cutcliffe: "We are thrilled to have Coach Knowles rejoin our staff. Jim played a big role in the success of our 2003 team at Ole Miss, so I know what we're getting in terms of his personality, work ethic and football knowledge. His understanding of defensive football is at the head of the class and our players will enjoy playing under his leadership. His experience as a head coach certainly will pay dividends within our program, and on top of his coaching abilities, we know he'll be a great fit on our staff because we're so familiar with each other." Cutcliffe also promoted coach Jim Collins to assistant defensive coordinator/linebackers coach. For the second straight game, both losses, Butch Davis said his team did not play smart. For Davis' part, he took the blame for the Tar Heels' mental errors in Saturday's 19-17 loss to Pittsburgh but apologies don't win games and at some point, and sooner than later with a $2 million price tag involved, those mistakes need to be corrected, not just acknowledged. UNC repeated some of the same mistakes from the inexcusable 28-27 loss at N.C. State on Nov. 28. Mindless penalties which cost UNC points? Check. Turnovers at the goal line which cost UNC points? Check. Davis disagreed that they were the same mistakes from the State loss, pointing out that they didn't kick the ball out of bounds against State, or jump offsides on a field-goal attempt, but he was splitting hairs. "They're not the same mistakes," Davis said. "If it was the same mistakes, you'd really be disappointed. We've to got to learn to play smarter and more efficient." When you're a team with no margin of error on offense, you can't afford 19 penalties in two games. The Heels' defense, as good as it was for stretches this season, can only do so much, which was never more evident than on Pitt's final drive. Davis tried to spin the bowl loss as Pitt being the better team, which I doubt he even believed, but it sounded better than acknowledging for the third time this season (Florida State and N.C. State) UNC lost a game it should have won. Even with all the injuries and personnel problems on offense, UNC was unbelievably close to 11-2. Instead, their coach had to apologize for being "not as smart as we needed to" and 8-5. • Greg Little (SirGregory8) gave Cincinnati receiver and prolific tweeter Chad Ochocinco a shout-out on Twitter on Saturday: "Ocho tune in to espn ...Somebody will kiss the baby today." Little celebrated his first touchdown, a spectacular 15-yard catch in the first quarter, by punting the ball into the stands (no word if that's slang for "kissing the baby" or not). "I didn't plan it," Little insisted after the game after confirming what he wrote on Twitter. "It just happened." Little was penalized 15 yards for the "impromptu" celebration and also got lit up by Davis on the sidelines. • Given the loyalty Davis and offensive coordinator John Shoop have shown to quarterback T.J. Yates — choosing him over Cam Sexton in 2007 and again at the end of 2008 — it's hardly a certainty that his 31st career start was his last but you have to figure that freshman Bryn Renner will be given every opportunity to win the starting job in 2010. Yates plateaued, at best, and regressed, at worst, in his third season as UNC's starting quarterback. With his experience, there's no reason he should have even attempted the pass that was intercepted in the second quarter at the goal line. And it's not just the random bad decisions (not that Shoop is absolved for calling a pass after running back Ryan Houston ran 10 times on the 12-play drive). Yates throws a fastball on nearly every pass attempt. For a guy with such good touch on his deep throws, he has no "off" switch on shorter or intermediate routes. He threw a great ball, with a ton of mustard, to Little for a third-quarter touchdown. A post route between the corner and safety is when you are supposed to load the gun and sling it. On second-and-goal on the same series as the interception in the second quarter, Yates threw a heater to the left corner of the back of the end zone that would have been too high for Yao Ming. He has got to lead Little on that throw with some air, not zip it as hard as he can. Those are decisions that a third-year starter should be making in their sleep and ultimately that could be what costs him his starting job as a senior. N.C. State offensive coordinator Dana Bible will be home for the holidays after spending about a month in the hospital undergoing treatment for cancer, school sports information director Annabelle Myers said Wednesday. Bible missed the team's final two games as he was hospitalized and diagnosed with acute promyelocytic leukemia. Myers said the cancer is in remission and Bible has been released from the hospital. She said Bible will continue to undergo chemotherapy as a precautionary measure for the next five to six months. Bible, 56, has been on coach Tom O'Brien's staff for the last 11 seasons, including eight of them at Boston College. Bible has coached two of the last four first-team All-ACC quarterbacks - Matt Ryan in 2006 at Boston College and Russell Wilson in 2008at N.C. State. Agreements have been reached with the ACC and the Big East to keep teams from those conferences playing in the Meineke Car Care Bowl for four more years, Ken Haines, president and CEO of Raycom Sports said Wednesday. Haines said the contracts have not been signed but the details have been finalized to extend the relationships with both conferences. Meineke, meanwhile, has one more year remaining on its contract as title sponsor of the game. The bowl gets the third choice among Big East teams and next year will have the fifth pick from the ACC behind the BCS game, the Chick-fil-A Bowl, the Champs Bowl and the Sun Bowl. Bowl organizers anticipate a crowd of more than 50,000 fans Saturday when North Carolina meets Pittsburgh at 4:30 p.m. in Bank of America Stadium. Will Webb, executive director of the bowl, said approximately 45,000 tickets have been sold so far and, if the weather cooperates, he anticipates a solid walk-up crowd on Saturday. The combination of the economy, a date one day after Christmas and North Carolina’s second consecutive appearance in the game are factors in ticket sales, Webb said. North Carolina has sold approximately 13,000 tickets, Webb said. Pittsburgh is expected to account for approximately 5,000 tickets, Haines said. “When you look at bowl attendance overall, the economy is factor,” Haines said. “While Pittsburgh is a great team and program, with the distance and the day after Christmas, it’s difficult for many of their fans to get here. When he’s not busy with his popular Twitter account, North Carolina defensive tackle Marvin Austin is hearing a similar question – is he going to enter the NFL draft next spring? “All the time,” Austin said when asked how often the subject comes up. “Seems like every other day somebody asks what I’m going to do. I don’t know. I really don’t. Austin, a 305-pound junior, had 40 tackles this season, including four sacks. In the regular-season finale against N.C. State, Austin had seven tackles, two sacks and a quarterback pressure. UNC's Davis: "Our team wants to be here"
North Carolina football coach Butch Davis isn’t buying into the suggestion that the Tar Heels aren ‘t happy to be in Charlotte for their second straight appearance in the Meineke Car Care Bowl. “Absolutely our team wants to be here,” Davis said in advance of the Saturday game against Pittsburgh. “We’re trying to build a program and make going to bowl games a yearly event. The Tar Heels arrived in Charlotte late Monday and held their first workout Tuesday afternoon at Charlotte Latin. Until this week, Davis said the Tar Heels had not had two days in a row of practice since the regular season ended due to exams. Reserve quarterback Mike Paulus won't be with North Carolina when it plays in the Meineke Bowl on Dec. 26 -- or next season. Coach Butch Davis announced that the sophomore will transfer and plans on attending William & Mary, where he will be able to play immediately next season. “Mike came to me a few weeks ago and asked to be released from his scholarship so he could transfer to an FCS school,” Davis said in a prepared statement. “Mike is seeking an opportunity where he can receive more playing time and I respect his wishes." Paulus, a former four-star recruit, played in four games at UNC as a redshirt freshman in 2008 and was 4-for-13 for 33 yards. He did not play at all this season, slipping behind Charlotte Latin's Braden Hansen for the back-up job. Playing time will be at a premium against next season, what with starter T.J. Yates returning for his senior year, star recruit Bryn Renner expected to compete for snaps after redshirting this year, and tailback/quarterback A.J. Blue expected to return to the lineup after an injury this season. “I’m ecstatic about the possibility of attending the College of William & Mary in January,'' said Paulus, who thanked UNC and its coaches for helping him narrow down his choices, and choose a program. "It’s a great academic institution with a top-notch football program. I look forward to playing for Coach (Jimmye) Laycock and competing for the quarterback job. East Carolina coach Skip Holtz turned down Cincinnati in 2007, and Pirate fans hope history repeats itself. Cincinnati is the latest school to eye Holtz; last week it was Kansas. Holtz elected to stay at ECU in '07, rejecting a jump to the Big East and a BCS conference. The Bearcats ended up with Brian Kelly, from Central Michigan, instead of Holtz. The Bearcats won two straight conference titles under Kelly. Still the program has more liabilities than assets, even though promising quarterback Zack Colloras, a redshirt sophomore, threw for 1,434 yards and 10 touchdowns while starting four times in relief of senior star Tony Pike. Along with Kelly, who left last week to take the Notre Dame job, some 16 seniors are moving out of a program that has won 16 straight regular-season games and went 34-6 in three seasons under Kelly. Against Florida in the Sugar Bowl, the Bearcats are expected to start 11 seniors and five juniors. Kelly won big despite playing home games in the Big East's smallest facility -- 35,000-seat Nippert Stadium. Another factor will be future non-conference schedules. In 2010, the Bearcats are set for N.C. State (in Raleigh), Oklahoma (in Cleveland), Miami of Ohio (home) and at Fresno State. The 2011 lineup is N.C. State (home), at Tennessee, Albany (home), at Miami of Ohio. So far, the 2012 card includes Ohio State and Virginia Tech. In addition to Holtz, the Bearcats are interested in Central Michigan's Butch Jones, interim coach Jeff Quinn, Temple's Al Golden, Cincinnati Bengals assistant Mike Zimmer and former Denver Broncos coach Mike Shanahan, who would be a long-shot dream. Jones, who met with Cincinnati athletics director Mike Thomas on Monday, has much fan support, due in part to the fact that Kelly previously coached Central Michigan. In three seasons at the school, the 41-year-old Jones is 22-12 overall but 20-3 against Mid-American Conference opponents. CHAPEL HILL — North Carolina freshman Donte Moss has been suspended for the Dec. 26 Meineke Bowl, coach Butch Davis said Tuesday. The reserve defensive end will continue to practice with the team, but will not play because of an altercation that occurred at the end of UNC's season finale against N.C. State. "Donte was involved in a thing at the end of the N.C. State game, and he made a very, very unwise action, pushing a guy away that was kind of taunting him and in his face,'' Davis said. "We had a private conversation and talked about it, and as I told him, it's something (where) you've got to have composure. It's frustrating, disappointing to lose a ball game, but you can't lose your cool and lose your composure. So we are going to suspend him for the game, and he's not going to participate and play." In July, Moss was also involved in an on-campus altercation with a teammate; a misdemeanor charge of assault was dropped. Davis said those involved at the time were "disciplined internally." ECU's Skip Holtz said no to one basketball school, Syracuse in 2008, but the football coaching job at Kansas is a more appealing offer is extended. After leading the Pirates to a second straight Conference USA championship, Holtz clearly is in the Kansas mix. He and Jayhawk athletic director Lew Perkins are tight. Perkins, then at Connecticut, hired Holtz to his first head coaching post in 1994. Whether Perkins can duplicate the same move may be known fairly fast. In his search to replace Mark Mangino, Perkins' primary shopping list consists of Holtz, Buffalo's Turner Gill, Central Michigan's Butch Jones and perhaps Stanford's Jim Harbaugh and former Auburn coach Tommy Tuberville. Unless that group is expanded, Holtz and the Gill have to rate as the most likely targets. It would be a shock if Harbaugh left Stanford and redshirt freshman quarterback star Andrew Luck for at least another year or two. Tuberville, who seemingly wants the job, may lack traction with Perkins. Although Mangino's teams went 12-1 in 2007 and 8-5 in 2008, Kansas football can be a risky venture. In nine seasons at Lawrence, his teams went 50-48 and 23-41 against the Big 12. Kansas has plenty of money, fans, impressive facilities and a better year-round climate than Syracuse. But football will always be the second sport at Kansas and even in the unimposing North Division, it's not easy to survive in the Big 12. Once mighty Nebraska has struggled to some extent over the past few seasons. Virtually everything about Big 12 football hinges on recruiting the states of Texas and California, both of which have been difficult areas for Kansas to harvest. Gill, 37, is a former Nebraska star and native Texan but has a 20-30 overall record at Buffalo. Holtz, 45, and his staff have almost no direct ties to either Texas or California, but is 38-26 at ECU. Even before the Board of Trustees approved a funding plan Friday that moved the creation of a Charlotte 49ers' football program one step closer to reality, former Carolina Panther safety Mike Minter had already begun lobbying to be the program's first coach. He didn't stop when contacted early Friday afternoon. "We've already had discussions early on," Minter said when asked about talking with Charlotte athletic director Judy Rose. "She definitely understands what's in my heart about wanting to be their coach." Minter has coached a private school -- First Assembly -- the past two years, winning the NCISAA Division II state championship with a 13-0 record this season. "When you make that commitment (as Charlotte did), people see they are for real about this," Minter said. "I'm excited this got passed." N.C. State football coach Tom O’Brien sounds optimistic about the chances that quarterback Russell Wilson will return to N.C. State in 2010. Wilson, who led the ACC with 31 touchdowns passes in 2009 as a sophomore, also plays baseball for N.C. State and will be eligible for the major league draft in June. "Right now, if it was today, he'd be back,” O’Brien told the crowd – which included Raleigh News & Observer reporter Chip Alexander - at a fund-raising dinner for the Toys for Tots program on Thursday night. Although N.C. State finished 5-7 and missed out on a bowl trip, the Wolfpack’s 28-27 win over North Carolina in the season finale took some of the sting out of a disappointing season for Wilson and O’Brien. Wilson threw four touchdown passes in the game against one of the ACC’s top defenses. Afterward, Wilson gave little indication of whether he was leaning toward returning to school or leaving. He said his religious faith would guide his decision. In baseball, Wilson batted .236 last season for N.C. State with two doubles, one triple and 10 RBIs in limited action. He made 23 starts, 19 at second base, but missed the first 22 games because of a knee injury suffered in the Papajohns.com Bowl. "He has never had a full year of baseball,” O’Brien said at the dinner. “With the injury last year he did not have a full year. I think it will take a lot for him to leave this year but there is that possibility." East Carolina coach Skip Holtz felt a sense of déjà vu as he looked at the Arkansas helmet displayed at the Liberty Bowl news conference Thursday afternoon in Memphis, Tenn.
Holtz felt like he should be an observer at the conference rather than a speaker. "I can remember sitting in these press conferences admiring my father,” said Holtz, whose father, Lou Holtz, coached Arkansas from 1977 to 1983. East Carolina (9-4) will meet Arkansas (7-5) on Jan. 2 in the Liberty Bowl in Memphis. The Razorbacks and strong-armed quarterback Ryan Mallett will present Skip Holtz with a different challenge from what Lou faced in bowl games as Arkansas’ coach. Lou had to stop Barry Switzer and Oklahoma’s powerful rushing attack to win the Orange Bowl 31-6 at the conclusion of the 1977 season. In the Sugar Bowl on Jan. 1, 1980, Arkansas and Lou Holtz couldn’t stop the wishbone as Alabama quarterback Steadman Shealy threw just seven passes in a 24-9 Crimson Tide win. Skip Holtz’s charge is to stop Arkansas passing game. For the second time in two games, Holtz’s East Carolina defense is facing a quarterback with excellent passing statistics. In the Conference USA championship game last Saturday, the Pirates survived 38-32 despite 527 passing yards in 75 attempts by Houston quarterback Case Keenum - who leads the nation with 5,449 passing yards and 43 touchdown passes. Now Mallett comes into the bowl game ranked sixth in the Football Bowl Subdivision in passing efficiency, right behind Keenum, who is fifth. Mallett, a transfer from Michigan, has passed for 3,422 yards, 29 touchdowns and seven interceptions. Arkansas coach Bobby Petrino sounded primarily concerned about the East Carolina defense. The Pirates had two first-team All-Conference USA players on the defensive line in C.J. Wilson and Linval Joseph, and two more in the secondary in Van Eskridge and Emanuel Davis. Arkansas did not play in a bowl game last season, and Petrino said the players and fans who are eagerly buying tickets are excited to be playing in the postseason this year. East Carolina is returning to the Liberty Bowl for the second straight season as Conference USA champion. Kentucky defeated the Pirates 25-19 last season in Conference USA’s third consecutive loss to a Southeastern Conference team in the bowl. Holtz hopes to break that streak, but will have to endure another game against a potent passing attack. Ticket sales for Meineke Car Care Bowl between North Carolina and Pittsburgh Dec. 26 at Bank of America Stadium are approaching 40,000, executive director Will Webb said today. Bowl officials aren't expecting a large crowd from Pittsburgh but are optimistic the Tar Heels' will bring a solid contingent with them, despite the fact it's the second year in a row they've played in the game. "North Carolina's ticket sales were good the last few days before the game last year. We're hoping to get that again this year," Webb said. Senior defensive end Willie Young, who finished his career ranked second in N.C. State history in career tackles for loss with 45.5, was voted the winner of the team's Governor's Award. At Appalachian State, they pride themselves on being able to handle winter weather. But the Mountaineers may want to pack an extra set of handwarmers just in case for their Saturday afternoon playoff game in Missoula, Mt. The good news is the forecast for the 2 p.m. kickoff is considerably better than it has been around Missoula this week. For several days, the temperature has hovered close to zero with a howling wind making it feel somewhere south of miserable. According to Accu-Weather, game day in Missoula should have a high temperature of 24 degrees with a chance for light snow, possibly accumulating up to one inch. The wind, however, is expected to be relatively calm. It snowed shortly before kickoff in Richmond, Va., last Saturday night and the Mountaineers won 35-31 on a cold, damp night so they have a sense of what they're in for going west. Had Saturday's game been in Boone instead, it would feel almost balmy with a high temperature predicted in the mid 30s. No matter what Appalachian State quarterback Armanti Edwards does Saturday in the Mountaineers' semifinal playoff gane at Montana, his most impressive play will come Sunday afternoon. That's when Edwards is scheduled to graduate at 2 p.m., completing his degree in graphic arts and imaging technology in 3 1/2 years. "It means a lot," Edwards said Wednesday. "That's whaht you go to school for, to try to get your degree and get the best job possible after school." In Edwards' case, he may find a job playing professional football. With his blend of speed and throwing ability, Edwards is likely to get a long look from several NFL teams. His schedule is open after the holidays. He said he hasn't scheduled any job interviews yet. Edwards expects to have at least 10 family members in attendance at his graduation but he hasn't made any celebratory plans, waiting to find out if the Mountaineers will be preparing to play in the national championship game on Dec. 18. I"m trying to focus on Saturday first then focus on Sunday," Edwards said. "You really don't want to go into graduation mad, coming in there with a loss, so I'm trying to focus on Saturday." Former N.C. State head coach Chuck Amato will be out of a job at Florida State after the Gator Bowl on Jan. 1, according to the Orlando Sentinel. Florida State running backs coach Dexter Carter told the Sentinel that coach Jimbo Fisher has informed Carter and three other assistants that they will not be retained after the bowl. Amato, 63, is in his second tour of duty with Florida State and has coached a total of 21 seasons there under Bobby Bowden, who is retiring after the bowl game. Amato's current title is executive associate head coach, and he's in charge of Florida State's linebackers. Strength coach Todd Stroud, who was on Amato's staff at N.C. State, and defensive ends coach Jody Allen also won't return next season, according to the Sentinel. Amato was 49-37 as N.C. State's head coach over seven seasons. He was fired after going 3-9 in 2006 and replaced by Tom O'Brien. Traditionally, bowl games give participating players a set of gifts, ranging from the expensive to the mundane. The Sports Business Journal put together a list of the gifts players will receive at each of this season's bowl games. Meineke Car Care Bowl (UNC vs. Pitt): Bose gift package or Ipod Touch and $20 gift card; commemorative photo from Richard Petty Driving Experience. Music City Bowl (Clemson vs. Kentucky): RCA HD camcorder. Multiple: Purchasing parties or gift cards from Best Buy, in various amounts. The Hawaii Bowl gives only a Hawaiian shirt, according to the list. But hey, you get a week in Hawaii. In preparation for his team's visit to Washington-Grizzly Stadium Saturday to face top-ranked Montana in the FCS playoff semifinals, Appalachian State football coach Jerry Moore is having noise piped in during practice sessions this week. The outdoor stadium in Missoula has a capacity of 25,200 and is expected to be nearly full Saturday on what is expected to be a 28-degree afternoon. "We've been out there before (in 2000) and we experienced some of that at Richmond (last Saturday)," Moore said. "We're just trying to get the players indoctrinated to the environment. "We're a team that doesn't huddle so two or three days of that should help us. It helps the process of communicating. It doesn't have anything to do with the game itself but we do a lot of talking at the line and (the noise) makes it difficult." Beyond the noise factor, Appalachian State must find a way to contain a Montana offense that has scored 91 consecutive points in its two playoff games. The Grizzlys scored the last 40 in a comeback win over South Dakota State then bumped off Stephen F. Austin 51-0 last Saturday, holding the top offense in the FCS scoreless while forcing 10 turnovers. Moore also said Appalachian State and Montana, the two winningest FCS programs over the past 10 years, will begin a home and home series in 2011. On paper, Boston College against Southern Cal looks like the only sure loss of the ACC's seven bowl games. The ACC should win no fewer than four of its other six matchups, if not all of them. But 90 percent of bowl winners are determined by which team wants to be there. Clemson and UNC would qualify as the conspicuous ACC teams that are not ecstatic with their bowl fate. Georgia Tech, Virginia Tech and Miami should beat inferior teams in their respective bowls. That leaves Florida State. Will the pressure of Bobby Bowden's final game be too much, for a team missing its quarterback? Or will the Noles make sure Bowden goes out a winner against a talented West Virginia team? When Appalachian State and Montana meet in the FCS semifinals Saturday way out in Missoula, Mt., it will be a match-up of the winningest FCS programs over the last decade. While Appalachian State leads the national championship count three to one this decade, the Grizzlys have won more games. Montana has a 118-22 record over the past 10 years compared to ASU's 101-32 record. Their only previous meeting came in Missoula on Dec. 9, 2000 when the Grizzlys beat the Mountaineers 19-16 in the national semifinals. This is Appalachian State's fourth trip to the semifinals in five years. Montana has made the semis three of the last five years. And if you're wondering what the weather might be Saturday in Missoula, the long-range forecast is for partly cloudy skies and temperatures in the 20s. That's an improvement over this morning when it was near zero with the wind blowing more than 20 miles per hour. For the second straight season, North Carolina is playing in the Meineke Car Care Bowl in Charlotte. The Tar Heels (8-4) have accepted a bid to play 17th-ranked Pittsburgh (9-3) at 4:30 p.m. on Dec. 26 at Bank of America Stadium in a game that will be televised on ESPN. Bowl officials sometimes are reluctant to invite the same team in consecutive seasons, but North Carolina's strong record and history of selling lots of tickets to the bowl made the decision easy, according to bowl executive director Will Webb. Boston College was the only other ACC team available to the Meineke Bowl. "We're very excited to have them coming back this year," Webb said of the Tar Heels. "In these economic times it's a great place for their fans to come. It's a good opportunity for them to play a ranked team in No. 17 Pittsburgh." In a statement, North Carolina coach Butch Davis said the Tar Heels are excited to be playing in the Meineke Bowl again. "We had tremendous fans support at the game in 2008 and will need that against this year against an outstanding Pittsburgh team," Davis said. Pittsburgh has accepted a bid toplay in the Meineke Car Care Bowl at 4:30 p.m. on Dec. 26 at Bank of America Stadium in Charlotte. The Panthers (9-3) will meet an ACC team to be announced later this afternoon. This will be Pittsburgh's second appearance in the bowl. "We feel this Pittsburgh team will make the Meineke Car Care Bowl a very exciting and competitive game," bowl executive director Will Webb said in a statement. Pittsburgh, which was 5-2 in the Big East, won nine of its first 10 games. Its three losses came by a total of 11 points. The team visited North Carolina earlier in the season, losing 38-31 at N.C. State. "Playing a national ESPN television game against a quality ACC opponent is a great opportunity and we are looking forward to the challenge," Pittsburgh coach Dave Wannstedt said in a statement. The numbers -- 216 yards passing and 51 yards rushing -- don't come close to doing justice to Armanti Edwards' impact on Appalachian State's dramatic 35-31 playoff victory over Richmond Saturday night. There's no way to fully measure the way the impacts a game, particularly a game like Saturday night when he breathed life back into a team that could have been finished, trailing 24-14 with less than 10 minutes remaining. Edwards showed no panic. He stood in the pocket like it was his, moved outside when forced to and made one good decision after another. After two fourth-quarter touchdowns had put the Mountaineers ahead -- and they were forced to come back one more time -- Edwards made it look almost matter of fact. "He's so confident. He does things we don't teach," his coach, Jerry Moore, said. Edwards -- with plenty of help from running back Devon Moore (175 yards rushing), receiver Matt Cline (nine catches including the game winner) and others -- carried Appalachian State within one game of another national championship appearance. The Mountaineers will be underdogs at Montana next weekend but with Edwards anything seems possible. N.C. State running back Toney Baker has won the Brian Piccolo Award, which is given annually to the most courageous football player in the ACC. The conference announced Friday morning that Baker won the award. Baker suffered a knee injury in the 2007 season opener against Central Florida that kept him out for the rest of 2007 and all of 2008. Piccolo was the ACC Athlete of the Year for Wake Forest in 1965 and was an inspirational player for the Chicago Bears as he battled cancer. At N.C. State, Baker faced the prospect that his knee injury might end his career. But he returned after a two-year absence to lead the Wolfpack with 773 rushing yards, ranking sixth in the ACC. He also had 355 receiving yards as one of quarterback Russell Wilson's top targets out of the backfield. "He has shown true courage in the face of adversity," N.C. State coach Tom O'Brien said in a statement. "It's difficult for a player to miss a year to an injury, but Toney's injury was so devastating that he had to miss two years. Throughout that time, Toney faced each and every challenge and setback with dogged determination and a positive attitude and has come back stronger than ever. He is truly an inspiration to our team." Baker, a senior, has been granted a sixth year of eligibility by the NCAA that would allow him to play for the Wolfpack in 2010. But he hasn't yet announced whether he will return to school or enter the NFL draft. For all the understandable attention directed at Appalachian State quarterback Armanti Edwards, his counterpart Saturday night -- Richmond quarterback Eric Ward -- has an impressive resume as well. Both Edwards and Ward have been the starting quarterbacks in 41 wins at their respective schools, a remarkable number. Ward isn't as dynamic as a runner or passer as Edwards but his success record is impressive. Ward is 17-6 in his career against teams ranked in the FCS top 25 and he's 7-1 in the playoffs. Like Edwards, he's not accustomed to losing. The senior is Richmond's all-time leader in passing yards (8,767), total offense (10,122), touchdown passes (60) and completions (767). He's also 41-11 as a starter. After losing to the Spiders in the season opener this year, Duke safety Matt Daniels said, "Eric Ward is a great QB. He really has great pocket presence and we had a hard time getting back there to him. When we did, he made plays with his feet while at the same time still looking downfield to make a throw. He's a great player." Georgia Tech junior defensive end Derrick Morgan has been named the ACC's defensive player of the year, the conference announced Wednesday. Morgan leads the ACC with 12.5 sacks and has led the Yellow Jackets to Saturday's ACC championship game meeting with Clemson. He received 21 votes in the ACC Sports Media Association balloting. North Carolina's Robert Quinn (seven votes), Clemson's DeAndre McDaniel (seven), Virginia's Nate Collins (one) and North Carolina's Quan Sturdivant (one) also received votes. Senior running back and all-purpose threat C.J. Spiller is the first Clemson player in 22 years to win ACC player of the year honores, conference officials announced Wednesday. Spiller received 29 of the 40 votes in the Atlantic Coast Sports Media Association balloting, easily outdistancing Georgia Tech's Josh Nesbit (eight votes), Virginia Tech's Ryan Williams (two votes) and Georgia Tech's Derrick Morgan (one vote). After returning to school though he was projected as a first-round draft pick, Spiller led Clemson to an 8-4 record, first place in the Atlantic Division and a spot in Saturday's ACC championship game Saturday in Tampa, Fla. He was the only player in the nation to account for touchdowns in five different ways this season - rushing, passing, receiving and on kickoff and punt returns. He scored at least once in every game this season and led the ACC with an average of nearly 184 all-purpose yards. Appalachian State quarterback Armanti Edwards is feeling more like himself this week and that will present a double-edged challenge for Richmond in the quarterfinal FCS playoff game Saturday night. Unlike last Saturday when Edwards' tender knee eliminated any designed running plays for the quarterback against S.C. State, the playbook will be wide open against the Spiders. "We get to run any play in the offense," said Edwards, who added he has run and made cuts at practice this week with no problem. "I didn't think too much about (my knee) last week because we didn't call any designed runs. One time during the game a big hole opened and I took off and it didn't bother my knee. After that, I told the coaches I could run any time I needed to." The Richmond defense presents a formidable challenge. The Spiders have allowed more than 20 points just three times in 12 games this season. Richmond has scored 86 points off the 25 turnovers produced by the defense this season. Last year, Edwards threw five interceptions in a playoff loss to the Spiders. "They're hard-nosed and they're going to get after the ball," Edwards said. "They're going to be in the spots where they're supposed to be. It's going to be tough." On a different matter, Edwards wanted to make clear this week that he has a close relationship with his father, Freddie, who is serving time in a South Carolina prison. Freddie Edwards was convicted of killing a man during his son's freshman season but the father and son have maintained contact. Edwards visits his father when he returns home to Greenwood, S.C.
With bowl pairings to be announced Sunday, it's still uncertain which two teams will play in the Meineke Car Care Bowl on Dec. 26 at Bank of America Stadium. "The picture is clearly blurred," Will Webb, executive director of the Meineke Car Care Bowl, said Tuesday. It appears Florida State, once considered a strong possibility for the Charlotte game, will now play in the Gator Bowl against West Virginia, allowing retiring Seminoles coach Bobby Bowden to coach his last game against the program that launched his record-setting career. "We want Florida State," Rick Catlett, president of the Gator Bowl, told the Raleigh News and Observer. What that means for the Meineke Bowl remains unclear, though it seems likely that North Carolina or Miami will be the ACC representative. Much will depend on the outcome of the ACC championship game Saturday in Tampa, Fla., between Georgia Tech and Clemson. The winner will automatically go to the Orange Bowl, but it's not clear where the loser would play its postseason game. The Chick-fil-A Bowl in Atlanta has reportedly set its sights on Virginia Tech, a move that would clear the way for the Gator Bowl to select Florida State. If the Atlanta bowl, which has the second ACC pick, does not take Virginia Tech, the Gator Bowl would be forced to take the Hokies according to ACC rules. If Georgia Tech wins the ACC championship, the Champs Bowl would be able to pick Miami with the fourth pick. That would send Clemson to the Music City Bowl in Nashville. Under league rules, the championship game loser can fall no further than the fifth pick in the ACC's bowl selection ladder. However, if Clemson wins the ACC championship, the league's one-loss rule would not allow the Champs Bowl to pick Miami (5-3 in the ACC) over Georgia Tech (7-1 ACC). League selection requirements don't allow a bowl to pick a team with two or more losses than a team it is passing over. The Music City Bowl in Nashville, Tenn., has been working on a North Carolina-Kentucky match-up, but that might not happen with the Gator Bowl's move to land Florida State. That could drop the Tar Heels back to Charlotte for a second straight year, depending on the outcome of the ACC championship game. The Big East representative will likely come from among Cincinnati, Pittsburgh, West Virginia and Rutgers. Cincinnati and Pittsburgh will meet Saturday to determine the Big East championship while West Virginia faces Rutgers. If Cincinnati, ranked fifth nationally, were to lose to Pittsburgh on Saturday, it's possible the Bearcats could wind up in Charlotte. Pittsburgh would be the Big East representative in a BCS bowl and West Virginia appears headed to Jacksonville, Fla., to face Florida State. With the next available Big East team, the Meineke Bowl would likely take the Bearcats over Rutgers. If Rick Catlett has his way, Bobby Bowden's final game at Florida State will be in the Gator Bowl against West Virginia. Catlett, the president of the Gator Bowl, said Tuesday that his bowl has the right to invite Bowden, who announced his retirement on Tuesday, and the Seminoles despite their 4-4 ACC record. Georgia Tech’s Paul Johnson has become the third football coach in ACC history to win conference coach of the year honors in his first two seasons in the league, ACC officials announced Tuesday. Virginia Tech redshirt freshman running back Ryan Williams and Boston College linebacker Luke Kuechly were named the ACC rookies of the year on offense and defense, respectively. Under Johnson, Georgia Tech is 10-2 and playing Clemson in the ACC championship game Saturday in Tampa, Fla. Johnson was the choice of 24 of 40 voters in Atlantic Coast Sports Media Association balloting. Clemson’s Dabo Swinney (10), Duke’s David Cutcliffe (four) and Boston College’s Frank Spaziani (two) also received votes. Virginia Tech’s Frank Beamer (2004-05) and Clemson’s Charley Pell (1977-78) are the only other coaches named ACC coach of the year in their first two seasons in the conference. Williams, the rookie of the year on offense, has rushed for 1,538 yards, the fourth-highest total in ACC history. His rushing total is eighth-highest for a freshman in NCAA history. He also has tied the ACC record for rushing touchdowns with 19 and set the conference record for touchdowns by a freshman with 20. Kuechly is averaging 11.83 tackles per game, the highest average by any rookie since the NCAA began tracking the statistic in 2003. A return visit by North Carolina or hosting Bobby Bowden’s likely last game as the Florida State coach are the most likely scenarios for the ACC side of the Meineke Car Care Bowl, executive director Will Webb said today. Bowl pairings won’t become official until Sunday but Webb said he’s optimistic the Dec. 27 game at Bank of America Stadium will have either the Tar Heels or the Seminoles as the ACC representative in the game. “We feel very good regardless of who we have,” Webb said. The Big East representative will likely come from among Cincinnati, Pittsburgh, West Virginia or Rutgers. After the Clemson-Georgia Tech ACC championship game Saturday night in Tampa, the bowl scenario should become clearer. The winner will be the ACC representative in the Orange Bowl. Webb said he anticipates Virginia Tech playing in the Chick-Fil-A Bowl in Atlanta and Miami playing in the Gator Bowl. Under ACC bowl rules, Miami’s 9-3 record would not allow the Hurricanes to slip farther down the bowl list. The loser of the ACC championship game, Webb said, could wind up in the Music City Bowl in Nashville while the Champs Sports Bowl in Orlando may pick Florida State. That would allow the Meineke Car Care Bowl to pick the Tar Heels for a second straight year. “Everybody would love to have North Carolina,” Webb said. It’s all conjecture at this point, however. “If the Chick-Fil-A Bowl decides to take the ACC championship loser, it throws all of this into disarray,” Webb said. The Orange, Gator, Chick-Fil-A and Champs bowls have the first four choices among ACC teams. The Music City, Meineke and Emerald Bowls then work with league officials to fit teams into bowl slots. If no agreement can be reached, the Music City Bowl will have the first choice among the three this year with the Charlotte bowl getting first choice next year. If Cincinnati, ranked fifth nationally, were to lose to Pittsburgh on Saturday, it’s possible the Bearcats could wind up in Charlotte. If both Pittsburgh and Cincinnati are unavailable, West Virginia or Rutgers become the most likely Big East representatives. Appalachian State coach Jerry Moore said he expects senior quarterback Armanti Edwards to be closer to full strength Saturday when the Mountaineers face Richmond in a second-round FCS playoff game. Edwards' running was limited in the Appalachian State game plan last Saturday against S.C. State due to a lingering knee problem. As the game wore on, Edwards scrambled a few times but the plan was to keep him in the pocket to avoid aggravating the injury. Moore said Edwards ran well in the team's Monday practice session and expects him to be ready for the Spiders Saturday night in Richmond. "No question Armanti is better than this time a week ago," Moore said on a conference call. Moore also said he expects running back Devon Moore to be ready despite a thigh bruise suffered against S.C. State. UNC placed four players on the first-team All-ACC defense while Duke and N.C. State placed one player each on the first-team offense. Read more, including complete lists. On a conference call Monday morning, the first question to Richmond football coach Mike London wasn't about Appalachian State, the Spiders' second-round FCS playoff opponent Saturday night. It was about whether he might be a candidate to replace Al Groh, his former boss at Virginia, who was recently fired. It was an obvious question, given London's ties to Virginia, where he served on Groh's staff for several years. The timing, though, could be better, given the Spiders' attempt to successfully defend the FCS national championship they won last year in London's first season back at his alma mater. "It's an unfortunate situation that happened (in Charlottesville)," London said. "It's a reality of coaching. "My focus is on the game with Appalachian state, my entire focus is on that. I'm not going to talk speculation, rumors and all that. I have a ballgame we have to prepare to win. That's all that’s on my mind right now." Richmond quarterback Eric Ward was taking the same approach. "That's not our focus right now," Ward said when asked about the coaching rumors. "We're really concentrating on Appalachian state right now. It's something we’ll worry about when the season is over." North Carolina's basketball tradition could land them in the Music City Bowl. The Music City is lining up a potential hoops-themed matchup between the Tar Heels (8-4) and Kentucky (7-5) for their bowl game on Dec. 27 in Nashville, Tenn. The two winningest programs in college basketball history meet annually, and are set to play this Saturday in Lexington, Ky., but the football teams haven't met since 1990. Regardless of the outcome of Saturday's ACC championship game, it's likely that UNC and Kentucky will meet in the 12th Music City Bowl on the Sunday after Christmas. It would be UNC's first trip to Nashville and the Wildcats' fourth, including the third in the past four years. Nashville has been good to Kentucky. The Wildcats beat Florida State in 2007 and Clemson in 2006. They have won their last three bowl games overall, topping East Carolina in the Liberty Bowl last season. Kentucky lost to Tennessee, 30-24 in overtime on Saturday, to finish the season 3-5 in the SEC. They beat Auburn, Vanderbilt and Georgia and lost to Florida, Alabama, South Carolina, Mississippi State and Tennessee. Vanderbilt beat Boston College in last year's Music City Bowl and the SEC has gone 3-0 since the bowl went to an ACC-SEC matchup. UNC has lost its past two bowl games, both in Charlotte, to Big East teams. The Heels beat Auburn, 16-10 in the Peach Bowl in 2001, in their last bowl game against an SEC opponent. The Music City Bowl kicks off at 8:30 p.m. and is televised by ESPN. The outcome of the Georgia Tech-Clemson ACC title game will affect the first four bowl tie-ins for the ACC but not likely the last three. North Carolina (Music City), Florida State (Meineke) and Boston College (Emerald) are tracking towards the last three tie-ins. The top four — Orange, Chick-fil-A, Gator and Champs — will have to wait for the title game on Saturday in Tampa, Fla. The biggest mystery is what the Gator would do with the choice of Clemson or Miami. The Tigers went to Jacksonville last year, and lost, but sold a ton of tickets. You factor in the Tigers are playing in the state of Florida on Saturday, in Tampa, and the Gator would likely take Miami over a road-weary Clemson, which also would have lost two straight to end the season. Miami has more television value and a history with West Virginia, which would offset some of the Hurricanes' shortcomings as a ticket draw. Clemson, at 6-2, couldn't be jumped by a 4-4 team for the Champs. Charlotte would be ecstatic with FSU and continue their improbable streak of strong matchups. The Cincy-Pitt loser (they play Saturday with the winner going to the BCS) wouldn't sell a ton of tickets but would likely be ranked in the top 25. North Carolina is out and Clemson is barely hanging on in the latest Associated Press college football Top 25 poll. The Tar Heels, which lost to rival N.C. State, 28-27 Saturday, fell completely out of the poll. The Heels were ranked No. 23 heading into the game. Clemson, which lost 34-17 to rival South Carolina Saturday, fell all the way from No. 15 to 25. The Tar Heels still picked up a few votes, as did East Carolina. At the top of the poll are No. 1 Florida and No. 2 Alabama, which meet Dec. 5 in the SEC championship game. During a phone conversation with coach Tom O'Brien earlier this week, ailing N.C. State offensive coordinator Dana Bible paid tribute to the Wolfpack seniors. "You know, as bad as it has been, these kids have fought through everything," O'Brien said Bible told him while undergoing treatment for leukemia in Chapel Hill. Seventeen N.C. State seniors will exhaust their eligibility Saturday when the Wolfpack (4-7, 1-6 ACC) plays its season finale against rival North Carolina (8-3, 4-3). In many ways, their career hasn't proceeded the way they'd hoped. The coach who recruited most of them, Chuck Amato, was fired after the 2006 season. The Wolfpack hasn't posted a winning record in any season since 2005. "They've been really through a tough period of time," O'Brien said. "I don't think there's any question that it hasn't gone exactly how they wanted to. But they've hung in there. They've persevered. They haven't been down at all. " Fourteen of the team's seniors (not counting running back Toney Baker, who's eligible for a sixth year because of injury) have started at least one game during their careers. - Defensive end Willie Young, who ranks third in school history in tackles for loss. - Offensive guard Julian Williams, a three-year starter. - Defensive tackle Alan-Michael Cash, who has 23 career tackles behind the line of scrimmage. - Center Ted Larsen, who along with Young has a good shot at continuing his football career in the NFL. - Running back Jamelle Eugene, who has 1,445 yards rushing and 679 receiving yards in his career. - Linebacker Ray Michel, who led the team in tackles in 2008 and was the 2009 leader before he suffered an ankle injury that slowed him for the second half of the season. - Safety Clem Johnson, the team's second-leading tackler. N.C. State has seen a lot of production from this group. Three offensive linemen who have been starters for the last two seasons will be gone after today. So will the entire starting defensive line. During difficult times, they have also contributed as much with their character, according to their coach. "I think because of them, I think the rest of the team has stayed together and played hard," O'Brien said. "That will be a great contribution (for the future)." Walk-on Daniel Imhoff will move into the backup role for N.C. State at quarterback Saturday against North Carolina because the regular backup, Mike Glennon, is out with a clavicle injury. Imhoff, a junior, has played in two games in his career, both this season. He has thrown one pass in his career and has yet to complete a pass. Starter Russell Wilson is the only other healthy quarterback on the roster for the Wolfpack's finale. Two other backups - defensive end Audi Augustin (elbow) and cornerback DeAndre Morgan (concussion) - also have been added to N.C. State's injured list and are out for Saturday's game. N.C. State released its injury report Thursday evening. Boise State coach headed to Virginia? The Charlottesville Daily Progress says Boise State coach Chris Petersen is the leading candidate to replace Al Groh, who's expected to coach his final game for the Cavaliers Saturday against Virginia Tech. The Observer's list of the top college football prospects among this year's high school juniors includes lots of QBs, several from Observer coverage area. North Carolina kicker Casey Barth and punter Grant Schallock appeared in Orange County court on Wednesday. Each received a continuation until Nov. 30 for charges stemming from an Aug. 27th incident. Barth, 19, was charged with two misdemeanors, one for attempting to purchase alcohol with someone else’s driver’s license and one for attempting to obtain alcohol as a 19-year-old. Schallock, 20, received one citation for attempting to obtain alcohol as a 20-year-old. Each player had previously been "internally" disciplined, UNC spokesman Kevin Best said, and will play against N.C. State on Saturday. Less than two weeks before bowl bids become official, Will Webb, executive director of Charlotte's Meineke Car Care Bowl still wonders which two teams will be playing at Bank of America Stadium on Dec. 27. "It's a little like predicting hurricanes in March," Webb said. "Last year was a perfect example. We never thought we'd have North Carolina here until the day it came for us to pick a team. We weren't sure about West Virginia, either. You just never know." It's fair to assume, Webb said, that Clemson, Georgia Tech, Virginia Tech and probably North Carolina are out of the picture for the Meineke Bowl this year. However, Florida State, Miami and Boston College are possibilities. Depending on what happens with Bobby Bowden's future at Florida State, he could be coaching his final game in whatever bowl the Seminoles play this year. On the Big East side, unbeaten Cincinnati and Pittsburgh are likely to be gone before Webb gets the third pick among Big East teams. However, the Gator Bowl has the option of choosing Notre Dame this year -- the last year the Jacksonville, Fla., bowl has that option -- and it's possible the Fighting Irish could end up there. That would potentially open the door for Pittsburgh or Cincinnati in Charlotte, depending on how the championship race and BCS bids play out. Otherwise, Rutgers could make its first trip to Charlotte and West Virginia remains a possibility for a return visit, with its large fan base. "There are still so many variables out there," Webb said. After sitting out Appalachian State's regular-season finale last Saturday with a minor knee injury, Mountaineers' quarterback Armanti Edwards is expected to be ready for the team's playoff opener Saturday at home against South Carolina State at noon. Edwards went through the Mountaineers' Monday workout with no problems, coach Jerry Moore said, and he expects the record-setting quarterback to be back in the lineup Saturday. Appalachian State and South Carolina State are meeting for the second consecutive year in the first round of the FCS playoffs. The Mountaineers won 37-21 last year. N.C. State offensive coordinator Dana Bible (at right in file photo) has been diagnosed with Acute Promyelocytic Leukemia, Wolfpack coach Tom O'Brien said this afternoon. Bible, who did not travel with the team for Saturday's game against Virginia Tech, will remain hospitalized for 30 days, according to O'Brien. "He'll fight it. If he has a chance to beat it, he'll beat it," O'Brien said. Last Friday, Bible informed O’Brien that his doctor had advised him against traveling to Virginia Tech. It was the first time Bible missed a game or a practice in 34 years of coaching. Bible, 56, has been a member of O’Brien’s staff since 1999 at Boston College. In addition to coordinating the offense, he serves as quarterbacks and wide receivers coach for N.C. State. 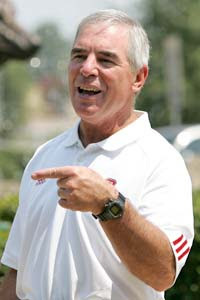 This is his second stint with the Wolfpack, as he coached quarterbacks and wide receivers under Tom Reed from 1983-85. He has coached two of the last three first-team All-ACC quarterbacks – Matt Ryan at Boston College in 2006 and Russell Wilson at N.C. State in 2008. "He's a great coach," Wilson said Saturday. "He's helped me tremendously." In 10 games with Bible calling plays this season, N.C. State has averaged 32.6 points and 413.2 yards per game. Both of those numbers ranked third in the ACC. North Carolina has a group of junior defenders contemplating skipping their final season for the NFL. Junior linebacker Bruce Carter said Monday he's staying in school. "I'm going to come back and finish my education, not only for me but for my family," Carter said. The junior from Havelock ranks third on the team with 48 tackles. He also has two sacks and an interception return for a touchdown. The Tar Heels defense, which ranks first in the ACC in total yards (261.6 yards per game) and scoring (15.9 points per game) has seven junior starters. Defensive tackle Marvin Austin, linebacker Quan Sturdivant, safety Deunta Williams and Carter are all considered NFL prospects. Carter, who will graduate with a degree in communications, said the decision wasn't that difficult. "I made up my mind a long time ago, I want to graduate and get my degree," Carter said. BLACKSBURG, Va. - N.C. State play-by-play broadcaster Gary Hahn isn't working today's game at Virginia Tech because he is recovering from prostate cancer surgery. Wolfpack Sports Marketing general manager Brian Asbill said the cancer was discovered in an early stage. "His prospects for complete and total recovery are excellent," Asbill said. Hahn, who is in his 20th season as the voice of the Wolfpack, was replaced on play-by-play by Tony Haynes, who usually serves as sideline reporter. Mark Thomas replaced Haynes on the sideline, and Johnny Evans remained in his usual position as color analyst. BLACKSBURG, Va. - N.C. State offensive coordinator Dana Bible did not make the trip to Virginia Tech for today's 3:30 p.m. game, school sports information director Annabelle Myers said this afternoon. Bible is undergoing medical tests of an undisclosed nature, Myers said. Running backs coach Jason Swepson will move from his usual position on the field up to the coaches' box and call plays for the Wolfpack. Bible, 56, also coaches quarterbacks and wide receivers for the Wolfpack. He has been a member of Tom O'Brien's staff since 1999 at Boston College, and previously served as quarterbacks and wide receivers coach at N.C. State from 1983-85 under head coach Tom Reed. With Bible at the helm, the N.C. State offense ranks third in the ACC in scoring (32.6 points per game) and third in total offense (413.2 yards per game). Swepson does have experience as an offensive coordinator, in one season at College of the Holy Cross. He will signal plays down to head coach Tom O'Brien, who will see that they get relayed to the field. N.C. State reserve wide receiver Steven Howard is out for the season with a knee injury, according to the injury report the school released Thursday evening. Howard, a graduate of Olympic High in Charlotte, made 13 catches for 186 yards this season. The NCAA has granted N.C. State senior running back Toney Baker's request for an extra season of eligibility, coach Tom O'Brien announced Thursday after practice. Baker missed all but one game over two seasons because of a knee injury before returning this season for the Wolfpack. Getting the extra year doesn't guarantee that Baker will return, though, because there is a chance he will enter the NFL draft after this season. "After the season I will talk to my family and Coach O'Brien and all these guys, and we'll figure out what's best for me," Baker said after practice Wednesday, before the sixth year was granted. Baker returned to the starting lineup at the start of this season and leads the team with 664 rushing yards. He also has caught 21 passes for 306 yards. O'Brien has said another healthy year at N.C. State might help erase any doubts pro scouts have about Baker's knee, but Baker wants to consider all his options after the season before committing to a return. N.C. State running back Toney Baker hasn't decided yet what he will do if the NCAA grants him a sixth season of eligibility. Because Baker missed all but one game for two straight seasons with a serious knee injury, there's a chance that the NCAA will award him an extra season in 2010. N.C. State coach Tom O'Brien has said another healthier year with the Wolfpack would help Baker erase any doubts that NFL scouts might have about his knee. O'Brien hopes to have a decision from the NCAA within the next couple weeks. Even if he is granted a sixth season, Baker could enter the NFL draft instead. "I haven't quite decided," Baker said after practice Wednesday. "After the season I will talk to my family and Coach O'Brien and all these guys, and we'll figure out what's best for me." Baker has bounced back nicely from the injury. He leads the team with 664 rushing yards and needs just 25 more to surpass his career season best, which was set when he was a sophomore in 2006. With 24 receptions for 306 yards and three scores, he already has career-high numbers as a receiver. He's in an unusual situation now as a senior who might be playing in his last two games over the next two weeks, but isn't quite sure. "It's almost crazy that I'm a senior already," Baker said. "It's gone by so fast, it seems like." Baker is preparing for a visit to Virginia Tech on Saturday as perhaps the only player on the current team who was at Lane Stadium the last time N.C. State played there. The Wolfpack won 17-16 that game in 2004 when the Hokies missed a field goal attempt in the closing seconds. That day, Baker was a high school senior on a recruiting visit - to Virginia Tech. "It was a great weekend," Baker said. "The fans there were great. It was a fantastic game. I think they had eight or nine sacks that game, something like that, and State came out with a win." Terrence Cody, anchor of second-ranked Alabama’s ferocious defense, and TCU’s Jerry Hughes are among the finalists for the Bronko Nagurski Award to be given Dec. 7 by the Charlotte Touchdown Club. The award is given annually to the top defensive player in college football as voted on by the Football Writers Association of America. Hughes was a finalist for the award last year and the only candidate nominated for a second time. Also nominated are linebacker Pat Angerer from Iowa, defensive back Eric Berry from Tennessee and Nebraska defensive tackle Ndamukong Suh. The awards program will include a keynote address by N.C. State coach Tom O’Brien. Former Carolina Panthers quarterback Steve Beuerlein will be the master of ceremonies. Roger Wehrli will receive the Legends Award during the program. For ticket information, call 704-347-2918. N.C. State has announced that football coach Tom O'Brien has been informed by ACC officiating coordinator Doug Rhoads that a key play in last week's loss to Clemson should have been ruled a fumble. According to a note released to the media by N.C. State, Rhoads said a play in the third quarter was a fumble that would have given the ball to the Wolfpack with Clemson leading 24-14. Officials initially ruled that Clemson running back C.J. Spiller was down and the play was dead before Clem Johnson stripped the ball away. O'Brien challenged the call, but a replay review upheld it. N.C. State's note to the media said Rhoads told O'Brien that the call should have been overturned and ruled a fumble. N.C. State quarterback Russell Wilson downplayed the idea Tuesday that family financial concerns will affect his decision on whether he will leave school to pursue a pro baseball career next summer. Wilson, who's a third-year sophomore in football and will play his third year of baseball in the spring, will be eligible for the major league baseball draft in June. His father suffered a stroke in the summer of 2008, and N.C. State football coach Tom O'Brien said in July that family health issues could cause him to leave N.C. State after just two football seasons. But Wilson downplayed that concern Tuesday during his weekly news conference with reporters. "It's not a huge factor for me," he said. "I know the Lord will bless me at the right time whenever it is, whether it's in the spring time, whether it's in the fall of next year or whether it's the spring after that. So I'm not really worried about that. In terms of financial reasons, like I said, I feel like the right situation will happen at the right time." Wilson reiterated his desire to be a Hall of Fame major league baseball player and quarterback. He hasn't announced a timetable for deciding on his football future at N.C. State, and O'Brien doesn't expect to discuss the issue with Wilson until after the football season ends. Wilson expects to earn his degree from N.C. State in the spring of 2010. DURHAM -- Duke guard Mitchell Lederman and backup quarterback Sean Renfree will miss the rest of the season because of injuries, the team announced this afternoon. Lederman, a 6-foot-7, 305-pound redshirt junior, suffered a fractured toe on his right foot during the Blue Devils' Nov. 7 game against North Carolina. Lederman started seven games at left guard this season and played in nine games over all. He underwent surgery at the Duke Sports Medicine Center this morning, according to a Duke news release. Renfree, a 6-3, 210-pound redshirt freshman from Scottsdale, Ariz., suffered a torn anterior cruciate ligament in his right knee during Saturday's 49-10 loss to Georgia Tech and will have surgery performed at a later date. Playing behind starting quarterback Thaddeus Lewis, Renfree appeared in five games this year and completed 34-of-50 pass attempts for 330 yards, four touchdowns and two interceptions. UNC defensive lineman Aleric Mullins, who needs to take only three hours next semester to graduate, has decided to forego his final season of eligibility, coach Buch Davis said. "In a similar situation as Richard Quinn [a tight end who left after last season, and now plays in the NFL], he just felt like with the completion of his degree, he just felt like it was time to announce that he was going to finish his career here and make himself available for any potential post-collegiate football that he might be available to," Davis said. Mullins has posted 14 tackles this season. With three straight ACC wins, North Carolina has put itself in a no-lose bowl situation. With two more wins, and the right breaks, the Tar Heels could end up in the Gator Bowl. Even with a loss, and the wrong breaks, the Heels could still wind up in the Music City Bowl. That's how much has changed for the Tar Heels (7-3 overall, 3-3 ACC) in a month. Before rattling off wins over Virginia Tech, Duke and Miami, the Heels had more wins over the Southern Conference (2-0) than the ACC (0-3). Any bowl would have been welcomed after blowing an 18-point lead in a 30-27 loss to Florida State on Oct. 22 and falling to 4-3 overall. With three straight wins, the Heels have worked their way into the mix for the Gator. First things first, UNC needs to win out. That means beating Boston College and N.C. State on the road. If UNC plays the way it did against Miami, Duke or Virginia Tech, the Heels will beat both BC and State. That would put them at 9-3 overall and 5-3 in the ACC. Like every bowl scenario, there are a lot of variables, but the winner of the ACC title game will shape how the dominoes fall. If Georgia Tech, which finished its conference schedule at 7-1 and won the Coastal Division, wins the ACC title game on Dec. 5 in Tampa, that would open up the Gator Bowl for either UNC or Virginia Tech. GT would go to the Orange, Clemson, after losing the title game, would go to the Chick-fil-A and that would leave the Gator the choice of either UNC or VT, both teams would be 9-3 overall. The Gator, in the final year of its contract with the ACC, Big East, Big 12 and Notre Dame, is likely to choose the Fighting Irish (6-4), unless coach Charlie Weiss if fired before the bowl game on Jan. 1, as the opponent. Which ACC team would make a more attractive matchup? Depends on the viewpoint. Normally, VT would sell more tickets than UNC, but there are two factors working against the Hokies -- their lackluster finish and their frequent travel to the state of Florida. Virginia Tech was ranked No. 4 in the country on Oct. 17 before a two-game losing streak knocked them out of the Coastal race and into the bottom third of the top 25. How excited is the fan base, which had visions of sneaking into the BCS title game, going to be about another Gator Bowl trip? Since joining the ACC in 2004, the Hokies have made six postseason trips to Florida -- the Orange Bowl in 2008 and 2007, the Gator Bowl in 2005 and the ACC title game in 2008 (Tampa), 2007 (Jacksonville) and 2005 (Jacksonville). UNC, which is closing with a bullet, hasn't been to Gator Bowl, or Florida for a neutral site game, since the 1997 season. Plus, UNC and Notre Dame played an exciting game in Chapel Hill, a 29-24 UNC win, last season, which could add some interest to the game from Notre Dame's perspective. If Georgia Tech loses the ACC title game, that changes the equation. At 7-1, GT can't be jumped by 5-3 team. That means the Jackets have to be picked before UNC. Since GT played in the Chick-fil-A Bowl last year, VT, at 6-2, would likely go to Atlanta, leaving GT in the Gator. That would put the Champs in position to choose from UNC (projected 5-3), FSU (4-4) or Miami (5-3) and it would be hard to say no to what could potentially be Bobby Bowden's last game, even though the Champs hosted FSU last year. That would likely push the Heels to Nashville for the Music City, against an SEC team on Dec. 27 and that's not a bad Plan B. There's a possibility, if UNC loses to BC and BC finishes 6-2, the best UNC could do is a return trip to Charlotte, but that's a worst-case scenario. There's also a possbility of BC winning the Atlantic, but we can cross that bridge if in the unlikely event Clemson stumbles at home against Virginia. N.C. State senior middle linebacker Ray Michel is listed as probable for Saturday's noon game against Clemson at Carter-Finley Stadium, according to a team injury report released Thursday night. The "probable" designation means it's estimated that he has a 75 percent chance of playing against Clemson. Michel suffered an ankle injury on Oct. 17 at Boston College and has missed the Wolfpack's last two games. He led the team with 53 tackles when he was injured, but has been surpassed now by outside linebacker Audie Cole. Appalachian State football coach Jerry Moore knows there are multiple challenges facing his seventh-ranked Mountaineers when they meet No. 6 Elon Saturday in what has become the Southern Conference championship game at Rhodes Stadium in Burlington. Perhaps most important will be finding a way to contain Elon wide receiver Terrell Hudgins, who has 25 career 100-yard receiving games and 362 career receptions, the most in Division I history. "If you break Jerry Rice’s record you’re probably pretty good," Moore said on a conference call Tuesday. "He’s a great player. He has a world of talent. He’s a guy you’re going to have to deal with him. That’s all there is to it. "A guy like that is going to make some plays on you. You hope you have a good enough scheme to keep those things to a minimum. That guy can grab it with one hand. He can probably get two fingers around the ball and catch it." So how will the Mountaineers defend Hudgins, knowing Saturday's winner will clinch the Southern Conference's automatic bid to the FCS playoffs? "You can only put 11 out there. How many are you going to surround him with? I don’t know," Moore said. Despite breaking a four-game losing streak Saturday, N.C. State’s coaches still are shuffling their defense to look for better combinations. Freshman cornerback Jarvis Byrd is set to make his first start when the Wolfpack plays host to Clemson at noon on Saturday. The depth chart for Clemson released Monday by coach Tom O’Brien shows Byrd starting at boundary cornerback, where he backed up redshirt freshman C.J. Wilson the previous two weeks. Wilson remains in the starting lineup, though. He will move to field cornerback – where he played earlier in the season – and replace DeAndre Morgan as a starter. Morgan now will back up Wilson. Byrd showed N.C. State’s coaches he was ready to play during the open date following an Oct. 17 loss at Boston College during which another freshman cornerback, Rashard Smith, suffered a season-ending knee injury. After being on schedule to redshirt after seven games, Byrd was installed as a backup to Wilson against Florida State and Maryland. Byrd played 14 snaps and made four tackles at Florida State, then played 30 snaps with two tackles in last week’s 38-31 defeat of Maryland. Junior Shaun Draughn, North Carolina's leading rusher, will miss the rest of the season after fracturing his left shoulder blade in Saturday's 19-6 win over Duke. Draughn, who leads the Heels with 567 yards, got injured on the first play of the game, a nine-yard run. He was replaced by Ryan Houston, who ran for a career-high 164 yards on 37 carries. Houston's rushing attempts were the most by a UNC player since 1990. Draughn's absence means there won't be much depth behind Houston. Running backs Jamal Womble (wrist) and A.J. Blue (knee) are already out for the year with injuries. Fullback Anthony Elzy got two carries at halfback on Saturday. Clemson's 40-24 win over Florida State means the Tigers have to beat N.C. State, in Raleigh, and Virginia, at home, to win the Atlantic Division. That's it and not even Tommy Bowden could screw that up (or only Tommy Bowden could screw that up). Even if the spirit of Bowden possesses the Tigers, 4-2 in the ACC, and they lose once, they would still hold the tiebreaker over Boston College (3-2), which finishes with Virginia, UNC and Maryland. That means Clemson and Georgia Tech, with a home win over Duke next week, will meet in Tampa on Dec. 5. That's also good news on the bowl front for UNC, which improved to 6-3 with Saturday's 19-6 win over Duke. Not only did UNC win, and get to within a win of its second straight bowl trip — and likely knock Duke (5-4) out of bowl contention — but Clemson's control of the Atlantic opens up the Music City Bowl in Nashville on Dec. 27. Charlotte and San Francisco are the other possibilities for UNC. If Boston College somehow wins the Atlantic, the Eagles could not fall further down the ACC bowl order than Nashville. If they don't win the division, BC would almost certainly go to the Emerald Bowl in San Francisco. Florida State's loss also means the Noles can't finish better than 4-4 in the ACC and can't jump a 6-2 team, potentially Miami, Virginia Tech or Clemson, in the bowl order. Notre Dame's loss was also good news for the ACC. The Irish, 23-21 losers to Navy, was effectively eliminated from a BCS bowl, possibly opening up a spot for a second ACC team, either Miami or Georgia Tech — if it loses to Clemson in the ACC title game. The Irish's loss also puts them in play for the Gator Bowl, against an ACC team. Five ACC teams (Clemson, Boston College, Georgia Tech, Miami and Virginia Tech) are bowl eligible. UNC needs one win while FSU (4-5) and Duke (5-4) need two wins. Wake Forest (4-6), Virginia (3-6) and N.C. State (4-5) need to win out while Maryland (2-7) has been eliminated from the postseason. The ACC has nine bowl tie-ins but likely will fill only seven, leaving the EagleBank and GMAC bowls to choose from the at-large pool. CHAPEL HILL -- It's good day to be Ryan Houston, and Casey Barth, but not Duke. Houston's career-best 164 yards, and Barth's four field goals, gave North Carolina a 19-6 win over the Blue Devils on Saturday at Kenan Stadium. The loss ends Duke's three-game ACC winning streak and leaves them 1-19 in the Victory Bell series since 1989. The loss also derails Duke's pursuit of a bowl bid and bolster's UNC's, which has won two straight in the ACC after an 0-3 conference start. Houston carried 10 times, on a 12-play drive, for 55 yards on the game-clinching touchdown, a 3-yard run by receiver Jheranie Boyd. Houston has a career-best 157 yards on a career-best 35 carries. Houston out-gained Duke's vaunted offense by himself, 179 total yards to 125. Charlie Brown's interception and 54-yard return set UNC up at Duke's 20 but a illegal block penalty on Greg Little on first down stopped UNC's drive before it started. Barth hit the 41-yarder on the last play of the third quarter for his third field goal. Barth, who kicked the game-winner on the last play of last Thursday's 20-17 win at Virginia Tech, also hit from 40, 29 and 33 yards. Nick Maggio hit two field goals in the first half to tie the game at 6 at the half. Maggio's hit a 26-yarder on the last play of the half and a 23-yarder as Duke's passing game has stalled after reaching the red zone twice. The Tar Heels have leaned heavily on their running game, minus Shaun Draughn, and Barth's right leg with quarterback T.J. Yates struggling. Barth hit a 29-yarder, his second field goal, after Yates whistled a high and hard fastball over the out-stretched hands of Greg Little on the 4-yard line. North Carolina scored first, on its first possession, running six times on a 10-play drive to set up a 40-yard field goal by Barth for a 3-0 lead at 11:25 in the first quarter. A blocked punt helped Duke even the score near the end of the first. Jordan Byas' blocked punt set up Maggio's 23-yard field goal to tie the game at 3. Maggio is subbing for regular kicker Will Snyerwine, who is out with a leg injury. The Heels, at least momentarily, lost starting running back Draughn who suffered a left shoulder injury on the fist play of the game. Byas blocked Grant Shallock at UNC's 30-yard at 4:00 in the first quarter to give Duke the ball in UNC's territory. A 22-yard pass from Thad Lewis to Brandon King got Duke down to the 14 but the drive stalled. Yates has badly missed at least four open receivers, including Erik Highsmith on a post route on the first possession. He has completed 15 of 26 passes for 112 yards. Lewis, who has four straight 300-plus games, has been held in check for 96 yards on 13-of-24 attempts with the one interception. Receiver Austin Kelly leads Duke with four catches for 22 yards. N.C. State’s players hadn’t won in so long that they forgot how to react when they did. Russell Wilson threw for three touchdowns and ran for another Saturday afternoon as the Wolfpack broke a four-game losing streak with a 38-31 defeat of Maryland at Carter-Finley Stadium. “Normally we come in (the locker room), and it’s kind of a somber mood,” said N.C. State defensive end Michael Lemon. Coach Tom O’Brien, who had told N.C. State’s players they were a bad football team after an error-filled win over Pittsburgh on Sept. 26, encouraged the players to celebrate this time. The Wolfpack (4-5, 1-4 ACC) still made plenty of mistakes against Maryland. Wilson threw three interceptions, including one that Alex Wujciak returned 70 yards for a touchdown. N.C. State’s wide receivers dropped three passes that should have been caught for touchdowns. Donald Bowens fumbled a punt, and the Wolfpack kickoff coverage team couldn’t stop Torrey Smith on an 82-yard return for a touchdown. But winning, finally, was cause for celebration. Maryland still had a chance to tie on its final drive despite losing starting quarterback Chris Turner to a left knee injury on a hit by Shea McKeen late in the second quarter. Jamarr Robinson, a sophomore from Charlotte’s Myers Park High who had never attempted a pass in a game, replaced Turner. Robinson didn’t hurt the Wolfpack much with his arm, completing just five passes in 11 attempts for 27 yards. He missed one wide-open receiver on a deep throw in the end zone in the third quarter. But on Maryland’s final drive, he scrambled for 11 yards and 19 yards to advance the ball to the N.C. State 34-yard line with 31 seconds remaining. “In the two-minute drill, I thought he did some good things for us,” said Maryland coach Ralph Friedgen. Lemon finally gave N.C. State’s oft-criticized defense a finish to remember, though. He sacked Robinson for an 8-yard loss when Maryland had no timeouts, and then hit him while he was throwing, causing an incomplete pass on the final play. The homecoming crowd roared its approval. Teammate Willie Young squeezed Lemon so hard that he couldn’t breathe. While eliminating Maryland (2-7, 1-4) from bowl eligibility, N.C. State kept its slim bowl hopes alive. The Wolfpack would need to defeat Clemson, Virginia Tech and North Carolina in its final three games to finish with enough wins to play in a bowl game. Every one of those opponents has a winning record. But N.C. State appears to have bounced back from its lowest point, when it lost to Duke by 21 points and Boston College by 32 in mid-October. Behind Wilson and a re-invigorated rushing attack, the Wolfpack has averaged 40 points over the last two games. Despite an ankle injury that kept middle linebacker Ray Michel out for a second straight week, N.C. State’s defense turned in its best performance in ACC play Saturday. Even though O’Brien wouldn’t say it, though, the Wolfpack still needs to cut down on mistakes to have any chance of making a late push toward a bowl. CHAPEL HILL -- It's good day to be a kicker and Ryan Houston. Casey Barth's four field goals, and Houston's 157 yards, have North Carolina in front of Duke, 19-6 at 3:56 in the fourth quarter. Houston out-gained Duke's vaunted offense by himself, 172 total yards to 127.